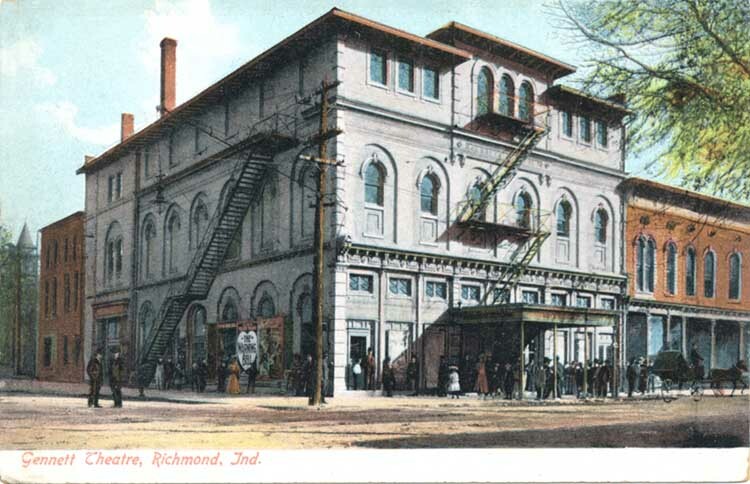 The Gennett Theatre was built on the site of the Bradley Theatre, which had burned down in September 1898. Clarence Gennett bought the property in the summer of 1899 and had the new theater built in an amazing 92 days, opening on December 22, 1899. In 1904, Gennett expanded and remodeled it. The Gennett Flats, the three-story building still standing to the east, was attached to the theater, its first floor consisting of dressing rooms for the performers. In 1916 Gennett renovated it again, this time to convert it to a motion picture theater. Its name became the Washington in 1918 and later it was changed yet again to the Lawrence. It was razed in 1935 to make way for a filling station. In 1964, the property was sold to Lingle Real Estate.